The 18th World Intercontinental Futsal Cup has kicked off in Bangkok, Thailand. The championships feature FC Barcelona Lassa of Europe, Chonburi Bluewave of Asia, Carlos Barbosa representing South America, Club Atletico Los Angeles from Africa, Elite Futsal of Central & North America and current holders Magnus Sorocaba from Brazil. This is the first time the tournament has been held in the South East Asian country and there were over 4,000 fans in the stands to witness the spectacle despite heavy rain in the area. The championships are also being broadcast across the world with several national tv stations covering the event that is growing in prominence. The inaugural game of the 2018 championships was between FC Barcelona Lassa and Utah Elite Futsal in Group B. It was Barcelona who scored the first goal of the competition as Elite lost possession near their own goal and Esquedinha, a Russian International, coolly finished with a shot that hit the inside of the far post and nestled in the back of the net. It wouldn’t be long before they got their second as the team from the United States struggled to escape the pressing of their opponent, a theme of the whole encounter. Joselito won possession 12 meters from goal before hitting an unstoppable rocket into the top corner. Surely it will be among the contenders for goal of the tournament. Barca continued to dominate but Elite were able to keep them from extending the score until a couple minutes before the half when a mistake from goalkeeper Danilo Silva deflected a corner into his own net. Despite this error and the number of goals he conceded, Silva was one of Elite’s best performers on the night as he denied Barca on several occasions . 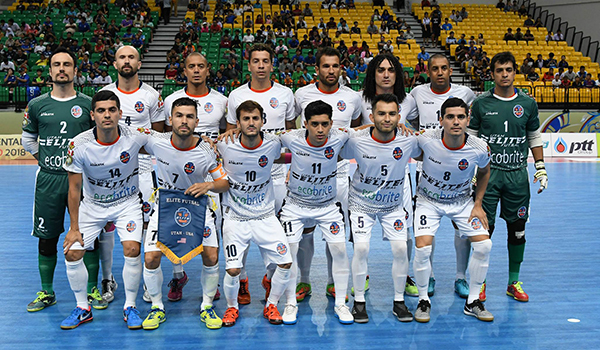 In the second half Elite Futsal were visibly tired, with several of their players professionals in the slower indoor soccer game in America, the intensity and talent of Barcelona was just too much. With the depth of talent the team from Spain possess they were able to rotate between three different quartets. They added five more goals to their tally to give a final result of 8-0. In the second game of the night it was local team Chonburi Bluewave against Club Atletico Los Angeles from Equatorial Guinea. It was the Thai team that started the stronger as their off the ball movement saw them getting in behind the African representative’s defence. The first goal, as in the opening game, came from a loss of possession in the defensive third. It was Chonburi who took advantage, having missed the first chance, finished on the rebound to send the crowd into wild celebrations. Club Atletico would get their revenge, stealing the ball in their opponent’s half to create a chance that was stopped in the area by the hand of captain Kritsada Wongkaeo who was subsequently sent off. The penalty was converted by Rodrigo Da Rocha to make it 1-1. Chonburi were having the majority of possession and chances but Club Atletico counter attacks caused a threat. On one of these Brazilian Keke pulled back Yusef Ali Al-Lal which was their 6th foul. It was Ali Al-Lal who would take and score the 10 meter penalty to give Club Atletico the lead that they took into half-time. After the break Chonburi started the brighter and Xuxa redirected a shot that was going wide into the back of the net to level the scores. Club Atletico quickly replied with a long ball enticing the goalkeeper to come out of his area leaving Fabricio to head into the empty net. Chonburi were determined not to disappoint their noisy home support and Xuxa scored a free kick after shooting between a gap in the wall to make it 3-3. Club Atletico missed two glaring chances on the counter attack and this would prove costly as Chonburi’s ball possession was creating regular goal scoring opportunities. The winner would come from a shot by Thueanklang that crashed off the underside of the bar and was tapped in on the line by Xuxa for his hattrick and a 4-3 victory. Day 2 will see the Brazilian teams make their debuts in the 2018 edition. First, Carlos Barbosa take on Club Atletico which will be followed by Magnus Sorocaba play Elite Futsal.